Butler's Luke Michalek (1) battles for possession with North Allegheny's Ray Sandherr during the Golden Torando's 58-56 overtime win over the Tigers Friday night. Michalek scored a game-high 21 points. WEXFORD — North Allegheny was missing two starters. Butler was missing too many shots. 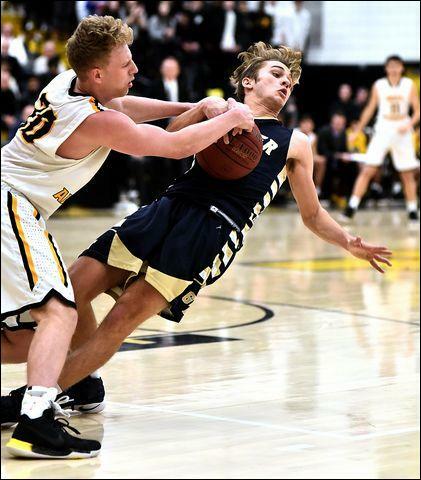 The Golden Tornado managed to erase an 11-point deficit in the final six minutes of regulation, however, then come away with a 58-56 overtime victory over the Tigers in a Section 1-6A boys basketball game Friday night. “This is the kind of win that can define a team, define a season,” Butler coach Matt Clement said. The Tornado (9-1, 3-1) sank just 14 of 42 shots from the field in the first three quarters. Eight of those were treys. And point guard Ethan Morton managed only seven points in those first three quarters. “They (North Allegheny) play good defense. I have to give them credit for that,” Morton said. “I was terrible tonight. Freshman guard Mattix Clement began Butler's fourth-quarter rally by sinking a trey from the right corner with 6:13 remaining. That trimmed a 49-38 deficit to eight points. Clement hit three treys in the period, the last giving Butler a 51-50 edge with 3:12 to play. North Allegheny (2-6, 0-3) tied the game with 2:21 left on a Mike Iuzillino free throw. Both teams had a few possessions afterward, but neither could break the deadlock. Clement's fifth trey of the game gave Butler a 56-52 lead in the extra session, but the Tigers knotted the game again on a Ray Sandherr trey and Anthony Hattrup free throw with 51.8 seconds left in OT. Morton got the deciding points on a driving lay-up with 38 seconds left. The teams traded possessions on turnovers. Butler gave the ball back to NA again — its 19th turnover of the night — with 28 seconds left. A driving lay-up along the baseline was blocked and Butler's Luke Michalek was sent the other way for a possible game-clinching lay-up. The shot was missed, both teams battled for the ball and it never made it back across midcourt before time expired. “We got the shot we wanted at the end,” North Allegheny coach Keith Noftz said. “I wanted our kid to take a three from the corner. but he drove to the hoop instead. Michalek led Butler with 21 points, six assists and six rebounds. He scored 16 of the Tornado's 27 points in the first half. “That was crazy. We couldn't get anything to go down early,” Michalek said. “But we stayed with it and eventually knocked down some shots. Morton had 12 points, 10 rebounds and four assists. Luke Patten came off the bench to collect nine points, 12 rebounds and three assists. The Tornado enjoyed a 41-27 edge on the boards. Butler sank 12 treys in the game, highlighted by Clement's five. “That kid is special,” Morton said. “For a freshman to come in, to not worry about missing a shot, to come right back ready to put it up ... I'm impressed by that. North Allegheny played without starting guard Curtis Aiken and center Zach Johnson. Both are out with injuries. Ray Sandherr paced the Tigers weith 19 points. Iuzillino had 14 points and six rebounds, Anthony Hattrup four assists and three steals. Noftz said his team's goal was to hold Morton to under 17 points. “He only got 12 and had to take a lot of shots to get that,” Noftz said. “I'm proud of our guys and the effort we gave. Butler has some guys who can hit the three. Luke Michalek 7-14 3-4 21, John Michalek 1-6 0-0 3, Mattix Clement 5-7 0-1 15, Tarik Taoufik 0-6 0-0 0, Luke Patten 4-9 0-0 9, Mason Montag 0-0 0-0 0, Ethan Morton 5-15 1-2 12, Dom Schmidt 0-1 -0-0 0, Isaiah Scribner 0-0 0-0 0, Nick Stazer 0-2 0-0 0. Totals: 21-59 4-10 58. Nikko Rankin 0-0 0-0 0, Mike Egnacczyk 1-2 0-0 2, Mike Iuzillino 5-11 1-3 14, Walker Davidson 2-3 1-2 7, Nico Erimias 3-9 0-0 6, Ray Sandherr 8-17 0-1 19, Stephen Humphries 1-2 3-6 5, Anthony Hattrup 1-5 1-4 3. Totals: 21-50 5-13 56.